J&J Richardson Electrical Ltd is a electrical contractor in Ealing. Is this different from an electrician? We sometimes get asked this question; an electrician is an individual tradesman and an electrical contractor is a business person or company that employs electricians. We hold the necessary licences and insurances such as the ‘National Inspection Council for Electrical Installation Contracting’ (NICEIC). We hold our licenses to properly and safely operate a business, protecting the employees and home owners/business owners from insurance liabilities. 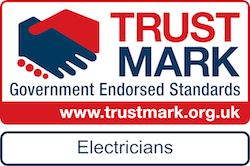 Approved NICEIC Qualified & Trustmark Endorsed Electrical Contractor in Ealing. J&J Richardson Electrical Ltd deliver a wide range of electrical services, that provide technical advice and recommendations that assure you that all electrical work carried out meets legal requirements and is above all, safe.